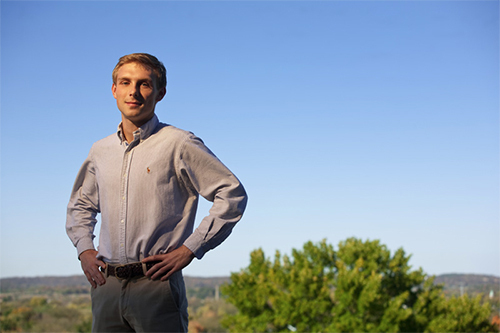 WKU student Aric Johnson of Bowling Green has received a Rotary Ambassadorial Scholarship to live and study for a year in Edinburgh, Scotland. He will be the second consecutive WKU student to travel to the UK on this scholarship: last year’s winner, Rachel Reetzke, is currently studying at the University of Cambridge in England. And according to Reetzke, he had all the components for a successful application. “I knew he would be WKU’s next Rotary Ambassadorial Scholar based on his natural desire to serve others,” she said. Reetzke, of Franklin, Ky., described the scholarship to Johnson as emphasizing service as much as academics. Johnson, an Honors College student who is majoring in biology with a pre-medicine concentration and holds a 4.0 grade point average, clearly has the academic qualifications. He also has previous international experience, having traveled to Kenya with Nancy Rice of WKU’s Biology Department. But it was Johnson’s history of service with developmentally disabled children that made him especially appealing to the Rotary Club in Franklin, to which he eventually applied. Rotary International is a humanitarian organization with clubs worldwide and a motto of “Service above Self.” Since 1947, Rotary Ambassadorial Scholarships have enabled more than 40,000 people from more than 100 nations to study abroad. Rotary Ambassadors give presentations in their host country, participate in activities with local Rotary clubs, and build good will, in addition to pursuing academic and research interests. Students are nominated and apply for the scholarship through a local Rotary Club. For both Reetzke and Johnson, it was the Franklin Rotary club. Franklin Rotarian Joe Phillips has a history of finding and selecting scholars for the competition. Reetzke put Johnson in touch with Phillips, who promptly invited him to a meeting. Phillips was as impressed with Johnson as he had been with Reetzke. “WKU is to be congratulated for turning out such young people,” Phillips said. Johnson calls that first meeting “a great introduction” to Rotary International. He was in the audience for the club’s annual speech competition; the prompt was to discuss the future of Rotary. Listening to these various ideas allowed Johnson to get a better idea of Rotary’s philosophy and mission. Johnson was attracted to the academic strengths of the University of Edinburgh, known internationally as one of the top 20 institutions for biomedical research. He will take courses in the biomedical sciences, pharmacology, pathophysiology and advanced biochemistry next year before attending medical school in the U.S. But perhaps the most important factor in selecting Scotland as the location for his Rotary year was the service focus of one of the Rotary clubs in Edinburgh. While researching, Johnson discovered that this club hosts an annual KidsOut Day, a festival for children from Special Schools in Edinburgh. Johnson, whose sister has Autism Spectrum Disorder, has volunteered in the past with groups such as the Special Olympics in Bowling Green and Big Brothers/Big Sisters. He also served as the Philanthropy Chair of the Sigma Chi fraternity, which works closely with The Children’s Miracle Network. Johnson is particularly excited about using his connection to the club as a way to become a member of the Edinburgh community, rather than just a tourist. Johnson received support from Amy Eckhardt, Director of the Office of Scholar Development (OSD). Eckhardt was immediately impressed with Johnson, calling him “an accomplished scholar, athlete and leader, with a distinguished record of service locally and abroad.” She worked closely with Johnson on his Rotary application, particularly the writing of his personal statement. With the limited space, Eckhardt told him, it might be helpful to think of the essay in terms of a two-minute movie trailer for a film of his life. The OSD also arranged mock interviews for Johnson, which helped him develop the ability to sell himself. The first was a smaller affair, with faculty and staff from the University, and the second was in a larger venue, with Johnson being questioned by Eckhardt, Alex Downing of the College Heights Foundation, Joe Phillips and past Rotary scholarship winners. “I cannot imagine a better ambassador for WKU and Kentucky,” Eckhardt said. This preparation made the actual interview “a breeze,” according to Johnson. Nevertheless, on the day that the results were announced, Johnson was still anxious. While on the golf course, he checked his e-mail every five minutes or so until he finally received the good news. He decided that he really did, and with his typical persistence and care, Johnson made all the necessary preparations to make his dream a reality. He is officially assigned to Rotary District 1020 in Edinburgh, but will be most active with the Rotary Club in Edinburgh, where he will live from September 2011 until June 2012 as a Rotary Ambassadorial Scholar. Johnson’s mother, Becky, a WKU employee, said she was grateful to everyone who assisted him in his efforts. “I expect only the greatest of things from Aric’s trip to Edinburg, as I know this time will allow him the opportunity for continued growth and a chance to make a difference with his life,” she said. Since receiving the Rotary scholarship, Johnson has also learned that he has been accepted to medical school at the University of Louisville and the University of Kentucky. About the Office of Scholar Development: The Office of Scholar Development is committed to helping students on all campuses and in all majors and degree programs develop the vision, experience and skills to be independent, engaged scholars. Students interested in investigating undergraduate scholarships such as the National Department of Defense SMART scholarships, or postgraduate funding opportunities, including the Fulbright or Rotary Ambassadorial Scholarships, should call to schedule an appointment with the Office of Scholar Development at (270) 745-5043.